I have a secret to let you guys in on. Since January of this year, I made a solemn vow not buy a single piece of clothing until the end of July. To some extent it was to prove to myself that I can be disciplined in my buying habits, and to some extent it was to see if I could seamlessly work with the pieces I already had in my closet for the coming Spring/Summer season. It hasn't been easy, especially with the style blog and all, but I'm happy to report that I still have not purchased any clothing since January, and have no plans to for the next several months. 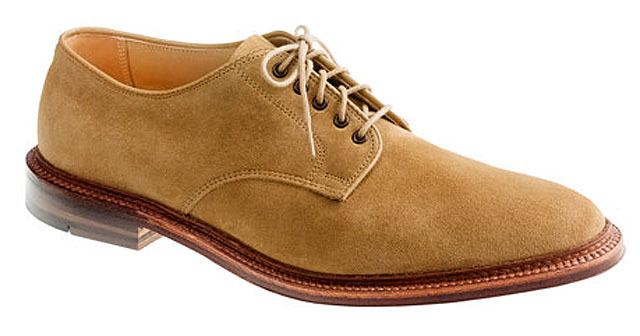 Suede bucks look so good in the summertime, that it's almost difficult not to get a pair after the month of May. The good news is that there are plenty of brands that make suede bucks, and at reasonable prices too. The pair above is certainly not one of them, but you can get ones from Bass or Florsheim that have price tags that are easier to swallow. I don't know what it is about checkered shorts, but I love them. Pair them with a solid colored T-shirt, henley, or casual dress shirt, and you got yourself an incredibly stylish outfit, without the fuss. These ones by GANT are pretty expensive, but I'm sure you can get a good substitute at your local J.Crew, Uniqlo, or Club Monaco. I've been on the lookout for a braided belt for several months now. Leather or cotton, I don't care. I just think they look great, are easy to wear, and can really up-level an already awesome outfit. Keep them thin in width, and in a fairly neutral color like brown, navy, or cream. Men's bracelets are all the rage these days. And to me, there is no one doing them better than Miansai. This Florida based company is creating some of the most stylish men's bracelets that I've ever seen, and I've been contemplating getting one for quite some time now. I've generally been a wristwatch-only guy, but I feel like I'll make the exception for a Miansai bracelet. So there's my wish list for June 2013. Still got over a month before I can actually make any purchases, but don't think I won't be drooling over the above items during that whole time period.